Chilton County has a number of talented musicians and artists. This talent is showcased in events throughout the year. Local and regional musicians play at events such as Peach Jam and the Perfect Note Jazz Festival. Some local musicians may also be heard at the third Thursday jam sessions at Pokana Talahassi in downtown Clanton. Each year thousands of people come to Verbena for En Fuego, a free concert featuring some of Contemporary Christian Music’s most popular bands. Past bands have included Third Day, For King and Country, Skillet, TobyMac, Kari Jobe and Kutless. Visual artists promote their work through annual art festivals and shows through the Chilton County Arts Council with headquarters in Clanton. 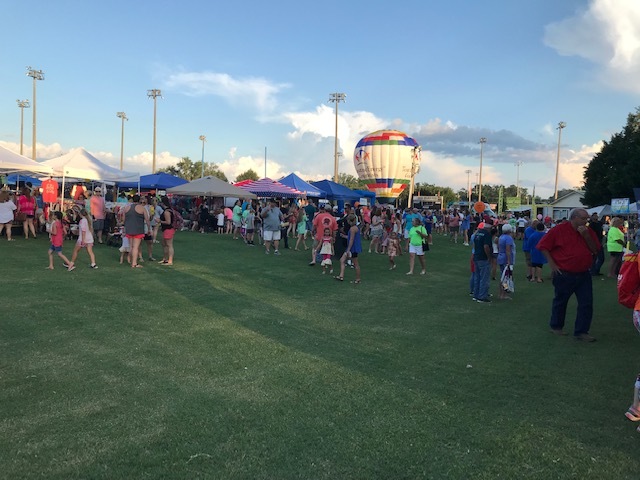 The Chilton County Art Festival is held in July at the Clanton Conference and Performing Arts Center on the Jefferson State Chilton-Clanton Campus. Local art is also often on display in the windows of the Arts Council office in downtown Clanton. The Arts Guild also encourages creativity beyond the canvas through March Gourd Madness and Another Man’s Treasure art shows. The Central Alabama Performing Arts Guild provides a place for residents of all ages to have a performing arts outlet. Each year the Guild performs a play on the Jemison City Hall stage, produces a dramatized radio play on 98.3 WSMX-LP and hosts the Perfect Note Jazz Festival. The Guild also supports the Jazz radio show “In the Mood,” which plays locally on 98.3 WSMX-LP. Chilton County’s young twirlers and dancers are a highlight of each year’s Christmas tree lighting in Clanton.